Peter Piper was born on 22 December 1896 at Roughway Farm in Plaxtol, the youngest of ten children (four brothers, five sisters) of Henry Joel Piper, a labourer from Heathfield, and his wife, Emma Diprose. He probably attended school in Plaxtol, and in 1903, when he was six, tragedy befell the family when his mother died. His father eventually remarried two years later to Alice Ann Banfield, and a half-brother named Herbert John was born in 1907. After leaving school around 1910 he found work as a farm boy and then later as a quarryman, and by 1914 his family had moved to Forge Cottage in Crouch. 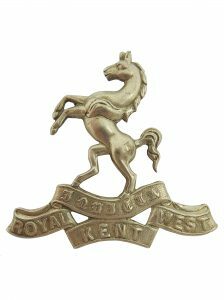 Undeterred, Peter re-enlisted in Maidstone on 15 July and underwent a second medical examination. On this occasion, the examining officer recorded that he had a history of fits, with two occurring during the preceding 12 months (perhaps the reason for his previous discharge.) Despite this, he was again passed fit for service and returned to his old unit. I am writing these few lines hoping they will find you quite well and I hope you got the other letter safe. I find it a little different from Chatham out here and we are having some nice weather. I found some of my old mates here so I am not all alone but I’ve not found Tom yet. I would rather have my old feather bed than these tents but still I have to put up with it. I am stopping at a place called the base but I must not tell you the name of it. I think this is all the news this time. Will write again when I get the chance. In answer to your letter I am writing these few lines hoping you are keeping well. I have been shifted from the base to another place. It is about two miles from the firing line. We can see the shells bursting when they are fired at the aeroplanes, but that don’t make me downhearted. Hope I can find Tom now I am here. When you answer the letter don’t put A.P.O.J.B.B.S.17 but put all the other and No. 13 platoon now I think. I must close. Hope you get it safe with love and kisses from Peter. P.S. Please can you ask Flo to write to me and then I will send her a card. Peter’s first taste of life in the trenches came on 27 March when his battalion took over a section of the line in the Quarries Sector from the 7th Royal Sussex Regiment. There was little in the way of trouble from the enemy, however, while he was there melting snow flooded the trenches. On 25 April the battalion was withdrawn to Allouagne where they began a two-month period of training before the summer’s ‘Big Push’. Just a few lines to you hoping you are quite well. Glad to say I am going on very well, excepting a boil on my neck which I’ve had to have lanced. We are having some very nice weather here and it is very hot some days. Better than a lot of rain. I have not seen anything of Tom yet but I have wrote home for his address so I can write to him and then perhaps I shall be able to find him. Did you get my other letter, which I wrote I sent those stamps back because we do not use them out here. Have you seen or heard anything from Dolly lately? I don’t know wether (sic) to write to her or not because she don’t write to me when I do. I had a letter from Lizzy a few days ago and it was a nice long one to. What a rough time out there has been in Dublin these last few days. At the end of June, The Queen’s Own began moving south towards the Somme area. They were now up to full strength and following an extended period of rest and training, were in good condition and ready for the imminent battle. On the first day of the Somme campaign the battalion was in reserve, however, the next day, while at a position just west of the ruins of Ovillers, they received orders to resume the attack in the early hours of 3 July. In the assault, ‘A’ and ‘C’ Coys were to take the first enemy line, while ‘B’ and ‘D’ were to pass through and attack the second. Unknown to the battalion, and in a replay of events two days before, much of the enemy wire had escaped destruction by the pre-battle bombardment which would prove fatal for Peter’s company. At 3:15 am the barrage lifted off the German front line and the two attacking companies in the first wave advanced under heavy enfilade machine-gun fire towards their objective. Despite the immense danger they bravely pushed forward and successfully took the line, and cleared it of any remaining Germans. Next came Peter’s company who, under covering fire from the two advanced companies, made their way across the captured enemy positions and charged towards the second line where they met a deadly hailstorm of enemy bullets and bombs. Any West Kents who made it as far as the next objective found themselves blocked by the uncut wire, and were mercilessly mown down in front of it. By the end of the day, of the 617 men who had gone into action, 375 were killed, wounded or missing. Peter was among the latter, and his body either never recovered or later identified. He was just 19 years old. Also killed in the attack was Richard Haxon Andrews from Wrotham Heath, who was in ‘A’ Coy. In addition to Platt, Peter is also commemorated on the Thiepval Memorial and the Tonbridge War Memorial .